No elevation from the Tallis Street View to grace the top of this post as Tallis depicted numbers 1-37 and on the other side of the street numbers 53-91, missing out 39 to 52. Did he plan another Street view of that section of Chiswell Street, continuing into Beech Street? Possibly, but then why would he include the occupants of those properties in the index? No logical answer seems to be available, so we will make do with Horwood’s street plan of 1799. 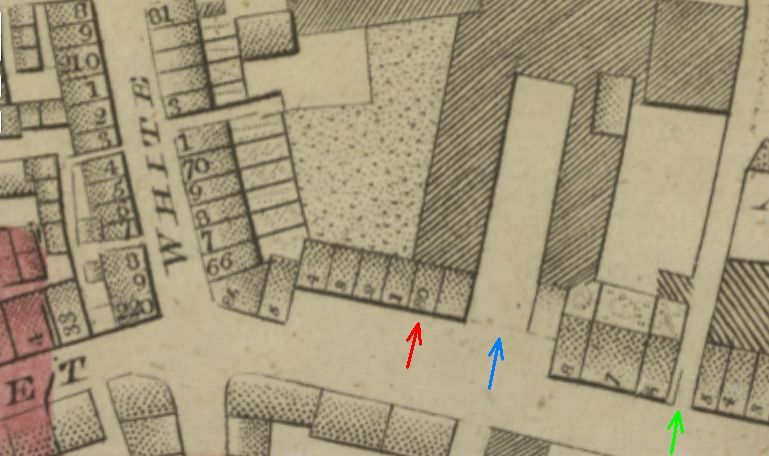 Horwood shows what became Smith and Pinkney’s property as number 80 (red arrow), just around the corner from Whitecross Street. The blue arrow points towards what is now Sundial Court, formerly part of the Whitbread brewery, and the green arrow points to Lamb’s Passage which is still there. I will spare you the rest as it is not so easy to follow the long sentences that were written with capitals in unexpected places and without punctuation marks or apostrophes. Joseph Smith, Pinkney’s partner, was most likely the Joseph Smith who was articled in 1821 as clerk to William Rosser. (2) When exactly the gentlemen decided to set up a practise together is unclear, but they are listed in Chiswell Street in Pigot’s Directory of 1839. They dissolved the partnership a few years later, in 1841, with Pinkney to continue the practice on his own. 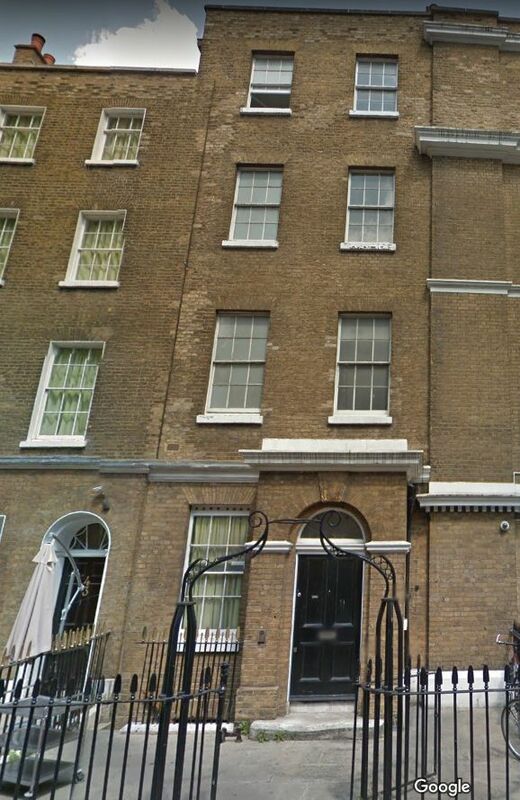 I could go on listing the businesses that occupied 41 Chiswell Street until the present day, but I think I will call it a day and leave you with a Google Street View of the property. (1) National Archives, Kew: Court of King’s Bench – Affidavits of Due Execution of Articles of Clerkship, Series II, Class KB 106, Piece 16. (2) National Archives, Kew: Court of King’s Bench – Affidavits of Due Execution of Articles of Clerkship, Series II, Class KB 106, Piece 5. (3) The London Gazette, 27 April and 7 May 1847. (4) England & Wales, National Probate Calendar (Index of Wills and Administrations), 1874. His estate was valued at under £450. 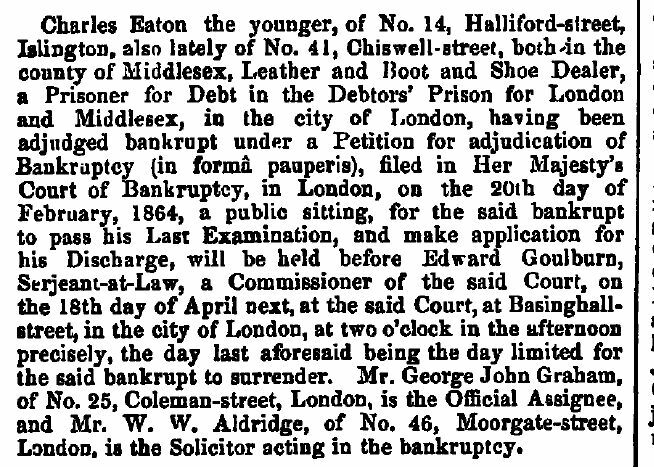 (5) The London Gazette, 18 March 1853. (6) The London Gazette, 2 March 1855. (7) The London Gazette, The London Gazette, 11 April 1862 and 25 March 1864.